Kensington Publishing Corporation, 9780758285034, 272pp. 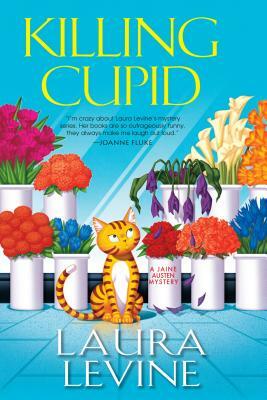 Love is in the air as freelance writer Jaine Austen begins a new job at the Dates of Joy matchmaking service--but between juggling her boss's demands, deflecting the advances of an eccentric suitor, and tracking down a calculating killer, she hardly has time to think about romance. . . When Jaine lands a job writing web copy and brochures for matchmaker Joy Amoroso, she's excited for a chance to help the lovelorn just in time for Valentine's Day--until she realizes what "Dates of Joy" is really all about. Joy is a ruthless taskmaster who screams at her employees for the smallest infractions, pads her website with pictures of professional models posing as clients, and offers up convincing but empty promises of love in exchange for inordinate sums of money. And woe betide anyone who lays a finger on her heavily guarded stash of chocolates. So it's no surprise when the chiseling cupid turns up dead at a Valentine's Day mixer. Aghast to find herself on the cops' suspect list, Jaine sets out to track down the killer. Who could it be? Joy's harried assistants, whose lives she made a living hell? Her younger lover? The handsome hunk of a client with a secret in his past? Or the furious Beverly Hills widow who forked over the last of her savings for a Prince Charming who never materialized? Joy left behind a slew of enemies struck by her deviant arrows, so finding the culprit may prove harder than spotting that elusive caramel praline in a box of chocolates--and Jaine will have to flirt with danger to get to the truth. . .
LAURA LEVINE is a comedy writer whose television credits include The Bob Newhart Show, Laverne & Shirley, The Love Boat, The Jeffersons, Three's Company, and Mary Hartman, Mary Hartman. Her work has been published in The Washington Post and The Los Angeles Times. She lives in Los Angeles, and is currently working on the next Jaine Austen mystery. Readers can visit her website at www.LauraLevineMysteries.com.